Four years ago at Rise Up’s Girls Voices Initiative in Ethiopia, I came together with girl leaders from across the country to discuss the challenges we face in our respective communities while drawing similarities, themes, and connections with each other’s experiences. It was a powerful set of Ethiopian girls fighting against the same battles separately. The meeting led me to realize that there were many girls who were working towards the betterment of girls’ lives across Ethiopia. In that moment, the thought of having a global forum of this kind was far from realistic to me. A couple of weeks ago, I received an invitation from Rise Up to attend the launching event of Michelle Obama’s program, the Global Girls Alliance, an online platform for girls around the globe to connect and learn from each other and equip themselves with tools to finance their visions with a focus on girls’ education. 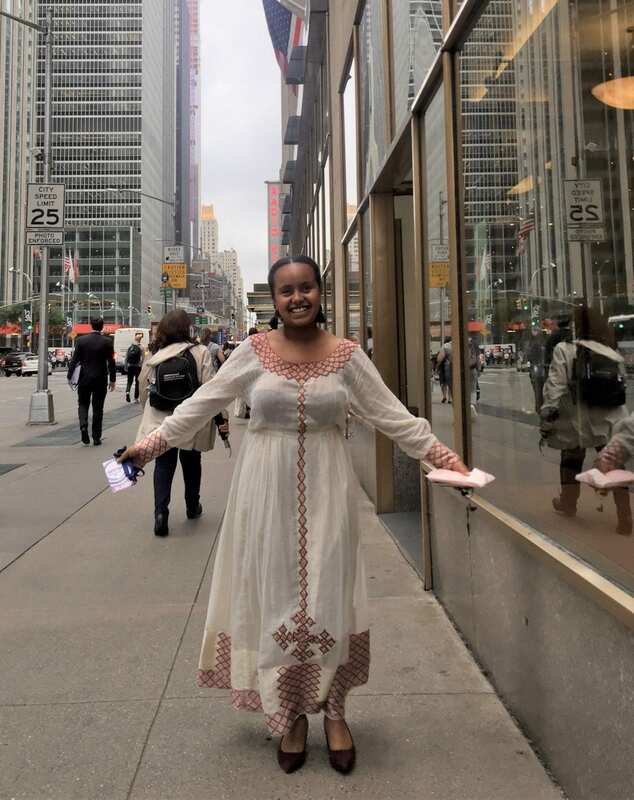 I was very enthusiastic about this event because it drew me back to my experience at Rise Up in Ethiopia – though, this time, the network of girls was even bigger and more ambitious. I was informed that there would be over 600 girls in attendance, and guest performances featuring renowned artists like Jennifer Hudson, Kelly Clarkson, and Meghan Trainor. I felt that in an event of such magnitude, my chances of meeting Michelle Obama or seeing my favorite artists would be at a minimum. Nevertheless, I felt very honored to receive the invitation. On the eve of the launch, nine girls and I arrived in New York City to attend an evening reception related to the event. The organizers had been vague about the details and we were led to a room that had nothing but chairs arranged in a circle and cameras that were rolling. Two girls seated next to me started discussing how they would react if Michelle Obama were to come in. I laughed at their speculations and quickly dismissed that idea from my thoughts, instead choosing to focus on figuring out why we were there. Ms. Tiffany Drake, the Director of the Global Girls Alliance soon opened a discussion about the importance of education in girls’ lives and in our personal stories. The thought that Michelle Obama could come anytime lingered at the back of my mind. True to our suspicions, a few minutes into the discussion, we received a splendid surprise when Former First Lady Michelle Obama walked into the room and joined our circle, giving us all genuine, unrushed hugs. It was instantaneously evident that Mrs. Obama was a sincere, dedicated, strong global woman. She asked about our inspirations and about our lives, and explained how Global Girls Alliance was her idea of “shining light” on an agenda that she truly believes in. She noted that her part was to help girls tell their stories and to facilitate change that activates generations all around the globe through those stories. Toward the end of the discussion, I asked Mrs. Obama for the reason behind the intentional focus on girls and not women or children in general, and her response was simply, “If you want to change climate change you start with a girl.” To hear powerful personalities echo such sentiments is not only motivating but also doubly effective in pushing change in the right direction. Hence with the most appropriate leadership, Global Girls Alliance will indeed push people, organizations, institutions, governments to open their eyes and observe the gravity of gender inequity around the world. Michelle’s vision for Global Girls Alliance will remind and encourage people to notice the individual girls, on the ground, fighting these problems every day with little help and guidance – sometimes out of necessity, and sometimes out of sheer determination. I believe there is an urgent need to focus on our girls if we are to achieve sustainable and transformative development, particularly in African countries. Thus, Global Girls Alliance will be another platform that communicates the same sentiment. The potential for Global Girls Alliance is immense. The Global Girls Alliance not only focuses on the connections formed through online interfaces but also works towards solving financial problems that are crucial to many. By offering a decentralized framework, it avoids the bottle neck of a tertiary institution that affects the overall efficiency. There are aspects of the model that I think would need local adaptations especially with respect to developing nations. From a perspective most familiar to me, the framework could be better aligned to fit with settings that lack access to internet connections, as the most crucial and urgent problems happen in the rural areas where internet connection is a luxury. In addition, the Global Girls Alliance’s GoFundMe platform used to finance ideas and projects could also potentially cause some friction. Many countries are not integrated with the western financial systems, and access to a credit card or online banking are not available either nationally or regionally. This necessitates adaptations with existing financial institutions, a process that might be slightly complicated to implement. However, the outcomes, if implemented correctly and effectively, can be profound. Contacts in the Global Girls Alliance who know the local context in their respective countries can help the Obama Foundation in addressing challenges like these and others that might arise at later stages. By collectively developing solutions, Global Girls Alliance will achieve tangible results in girls’ education globally. Rise Up’s model and impact is proof that girl-led advocacy works best. I believe improving girls’ education has to be the same. By collectively developing solutions with girls through institutions like Rise Up and Global Girls Alliance, we will achieve tangible results in girls’ education globally.